and pendants. All the jewellery is hand made. Range of handmade fashion necklaces, bracelets, earrings and rings. 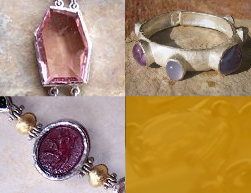 fine handmade Italian jewellery from silver, precious and semi-precious stones. One-of-a-kind exclusive jewels, including rings, earrings, pendants, bracelets, necklaces, cufflinks & brooches.